The Octo series from Amada is very practical, and has an excellent price/performance ratio.. It has 300 kN force of punching with its Double C frame. It has the ability to handle eight stations at a time with one of those stations able to adjust to any angle. CAD/CAM software from Merry Mechanization called SMP, can help optimize the tool path of the 8 stations this hydraulic CNC-punching machine. The linear magazine tooling system has a maximum hit rate is at 15 per minute and increases dramatically to 300 per minute when it's in marking mode. 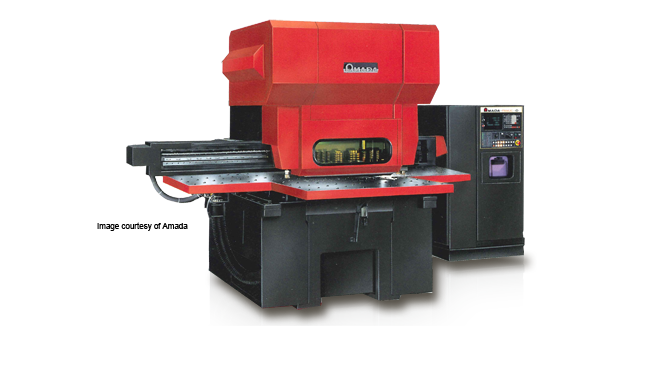 The working range of the Octo 344 sheet metal machine is 750 mm x 1000 mm. The Octo 344 is ecomonical especially when you consider a tool change can happen in less than two seconds and the tool life is long. The CNC punching machine can handle special tools as well as standard tools.